At the beginning of the new year, I had made a list of books I wished to read this year and I am glad I am doing quite well in that. One of them was the Twilight Series by Stephenie Meyer. I had seen the movie- Twilight I and had not quite enjoyed it so much. So, I never gave a thought about reading the book until my best friend wrote to me about her love for the Twilight Series. 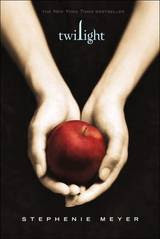 That is what intrigued me and I brought the first book in the series, Twilight from the library. I found it in the young adult section in the library but, I think this will appeal to a much wider audience. I am glad to have read it and hope to read the other books in the series soon. It is a 'Human-Vampire' love story like no other. The story starts with Bella (Isabella Swan) leaving her mom's house in the sunny Phoenix for her father's place in a gloomy and small place called Forks to complete the rest of her high school. Its gloomy in Forks because it always cloudy and rainy. For Bella, good bright weather is like a dream in Forks. On top of that she has to sink into a new school with a whole lot of new friends. But, gradually, she adjusts herself in the new surroundings and even makes new friends. Bella is by nature shy, under confident yet curious and observant. She is very intrigued by the Cullens, Edward Cullen in particular. She finds the Cullens different from the rest of the students in school. Despite Edward cold and unpredictable behaviour towards her in the first few encounters, she feels deeply attracted towards him. The very look at him sends a chill through her spine! The adjectives used to describe Edward in the novel like 'inhumanly beautiful' with 'luscious skin', a husky voice makes him instantly addictive to the readers as well. Later in the story Bella and Edward fall in love despite the fact that they are all together different beings. They seem to deny any logic and hope that their relationship will somehow work. The story takes an interesting turn when another Vampire falls for Bella's blood and Bella has to run for her life. After several twists and turns things fall into places, But how? That's the thing to read in the novel. The whole story is said with the perspective of Bella. The readers knows just want Bella tells and thinks. So, as the story proceeds secrets about the Cullens are unravelled one by one and that builds up the suspense in the novel as one keep thinking what more is in store. The story will keep you hooked till the end. The first half of the novel is relaxed, with vivid details about the places and characters. The second half is where all the action happens. The language used in the book is very simple and easy to understand. Meyer has depicted the feelings of teenage love very well. If you are still intimidated about a human-vampire love story, I recommend you read this book. Something about vampire stories bore me..I've seen the movie and didnt like it .. Bu i really need to read the book to know what has made the book so successful ! "It is a 'Human-Vampire' love story like no other." Well, that is true, because it doesn't have anything to do with 'vampires'! I've read the books and I liked them for just a one-time read. If Edward were anything like a vampire, and Bella was actually as mature as she is supposed to be it would have been much more complicated. You don't fall in love with a vampire over a semester! It's a good book, but you shouldn't expect it to be more than just a teen love story! A lot of people are of the same opinion.. They liked the novel better than the movie. I am yet to watch it coz i think it would spoil the interesting plot when I read it..
@Bedazzled: I was also unsure abt a vampire love story.. But, I think u can give it atry for sure.. I agree its a teen love story.. and it will be a welcome break if u have been reading serious stuff.. I found it refreshing! @Hema: I saw the movie first and then read th book.. I am sure doing it the other way is better! Haven't read any vampire stories, never even venture that side of the bookshelves in the library or bookstores but I think should give it a try. The fact that people didn't like the movie is..its difficult to express one's emotions..the book is all about what runs in bella's mind..its going to be difficult to express the conflicts, the love, the confusion..i felt that way, it was very descriptive in the book and i loved the character of edward..